We would like to share information with you about the following topics: Holyoke STEM Academy named Project Lead the Way Computer Science School; Useful College-Related Information for High School Seniors and their Families; High School Redesign – performing Media Arts Academy News; The Importance of Regular School Attendance – Strive for Less Than Five Days Absent; Upcoming Events and News Briefs. Holyoke STEM Academy officially received their banner naming the school a Project Lead the Way Computer Science School. This means that all scholars in grades six and seven will complete the Computer Science for Innovators and Makers beginning in January. All eighth-grade scholars will complete the Apps Maker beginning in January during their science classes. This will allow scholars to engage in hands-on experiences to tackle real-world problems using technology to innovate ideas. Holyoke STEM Academy received a $15,000 grant through Verizon Innovative Learning to implement the Project Lead the Way Computer science courses. Join us for another FAFSA Day on Monday, December 17th at the Holyoke High School North Campus (sponsored by Holyoke Community College) where you and your parents can come in from 9:00 AM – 12:15 PM to complete your financial aid. This is important if you need financial aid assistance to go to college. Please visit or email your counselor to register and receive a list of what documents to bring. This is FREE money you don’t want to pass up. There are many scholarships available to high school seniors. Please visit the scholarships links on the North and Dean campus web pages or access them directly at: Dean Campus students and North Campus students. The following information is included with the permission of Damaris Perez, a reporter who visited HHS to prepare the following article that was published in Spanish in El Pueblo Latino on December 10th. 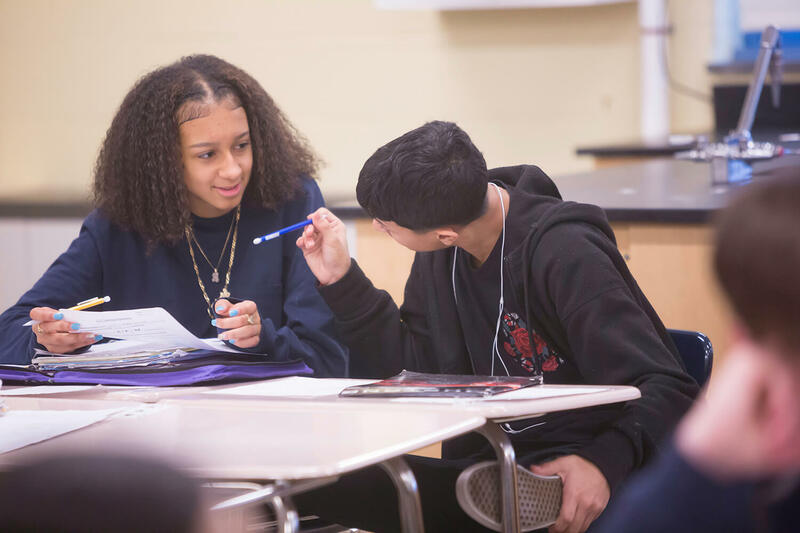 Holyoke High School offers countless programs and classes on behalf of students so that they can get an idea of ​​what they want to do once they acquire a fourth-year diploma. From providing what they call the “Reverse Job Shadow Overview,” to monthly town hall meetings, for youth participating in the new Performing and Media Arts Academy program, where young people gain a better understanding of the true meaning of the arts Scenic and multimedia, everyone benefits from the essence of the programs by participating. The teacher of Theater and Media Literacy, Bevan Brunelle, gave a workshop under the Performing and Media Arts Academy program at Holyoke High School where young people had the opportunity to listen to several community leaders and their roles in the arts and today’s multimedia which is manifested in print and electronically with varied media of social communication. Brunelle was a science teacher at Kelly Elementary School where she allowed students to develop their intellects and manual skills by creating an original invention. Now with her new title of Theater and Media Literacy teacher, she aims to inspire students to have a better idea of ​​what their students can take as a career in the not too distant future. During the workshop, several young participants dressed in masks and costumes and others participated in listening to a visit from a local reporter who gave them a short story of what she does daily in her work. Brunelle will be producing a play at the school on January 11 and 12, which will allow students to really experience everything that is required to produce a play. See the Events section below for more information about the play. Success in school requires students actively participating and highly engaged in learning. Regular class attendance and arriving at school on time and ready to learn enables students to benefit from classroom and school activities. These shared academic experiences are integral to the learning process and cannot be re-created or replicated. How many absences are too many? If a student misses 2 days a month, this adds up to 20 absences per year or more than 10% of the school year. Students who miss 10% of days (18 days if enrolled for the full school year) are considered to be chronically absent. We understand there are times when illness or emergencies cause students to be absent. However, students should strive not to be absent more than five (5) days in the school year to maintain satisfactory attendance. This applies to both excused and non-excused. Making daily attendance and punctuality a priority is important for students of all ages. Students who are chronically absent are at risk for falling behind, not meeting with academic success, and are 7.4x more likely to drop out of high school. Research shows that poor attendance in the early years can keep young children from reading proficiently by the end of third grade. Help your child build the habit of regular attendance. Start good habits when your child is young – begin stressing the importance and consistency of punctuality and daily attendance for your pre-K student. This can lead to good attendance during the elementary and high school years and carry forward to college and career. Visit our Attendance webpage for resources and more information. Click here to access the HPS Attendance Policy (PDF). View video about the importance of consistent attendance and punctuality at https://youtu.be/hEI13UOWK04. December 13 – Cookies and Cocoa at Donahue School, 5:00-7:00 PM, We hope you can join us at this family-friendly holiday event. Contact Ms. Langlois if you have questions about this event. December 15 – Save the Date for the Kids Make CHANGE Fest at Holyoke Merry Go Round – from 12:30 pm to 3 pm. This event supports & celebrates Metcalf’s fundraising efforts. All families are welcome! December 16th – Save the date – Breakfast with Santa fundraiser at Tavern on the Hill from 9 AM to 11 AM that features a breakfast buffet, professional photos with Santa in a beautiful rustic setting, story time, and crafts with Santa’s elves. Tickets are $10 and can be purchased at https://www.eventbrite.com/e/breakfast-with-santa-tickets-5… All money collected will go towards purchasing wish list items for Holyoke children in need. December 24 – January 1 – Winter Break – Schools are closed – (Note: HPS school and district offices will be closed 12/24, 12/25, 12/31, and 1/1). January 11 & 12 – Holyoke High School Theater Company’s Production Caught in the Act at 7:30 PM at the HHS North Auditorium – The show is produced by The Holyoke High School Theater Company which consists of student actors and technical crew in grades nine through twelve. Caught in the Act is written by Pat Cook and is directed by Bevan Brunelle. The set for the performance has been designed and built by the Carpentry students and David Brueshaber and Chef K and his students will be whipping up some goodies to sell at both performances at the concession stand. Advanced Tickets can be purchased online at www.bit.ly/HHSPLAY or at Holyoke High School. Tickets are $10 for General Admission and $5 for Students. Tickets are on sale now at the North campus and will be on sale at the Dean Campus starting this Friday. If purchased at the door, they are $15 for General Admission and $8 for Students with ID. Student IDs will be checked at the door for all online purchases. The HHS Madrigal singers have been extra busy this holiday season. This week they brought their spectacular voices to Gary Rome to share holiday carols. View photo and videos here. Also, click here to view the HPS Media Center video of the event. Thank you shout out to Gary Rome Hyundai for providing tickets for some of our students to attend The Albany Berkshire Ballet’s The Nutcracker at Symphony Hall. Holyoke STEM Academy hosted a STEM Digital Night last Friday where people could explore the apps, coding games, and activities scholars created during Computer Science Week. Visit our district Facebook page for event photos provided by Principal DeMars. Some 7th-grade scholars from Holyoke STEM Academy went to Morgan School to read their water cycle books to the 4th graders and teach them about the water cycle. Unified Basketball – the team is invited to be recognized at the December 17 school committee meeting in the Fifield Room at the HHS Dean Campus, 6:00 PM. We hope you can cheer on these athletes at their two exhibition games – 12/11 at Chicopee at 6:15 PM and 12/21 at HHS North Campus at 6:15 PM. Nos gustaría compartir información con ustedes acerca de los temas siguientes: Holyoke STEM Academy named Project Lead the Way Computer Science School; Useful College-Related Information for High School Seniors and their Families; Rediseño de la Escuela Secundaria – Presentando Noticias de la Academia de Artes Mediáticas; La importancia de la Asistencia Regular a la Escuela: Luchar por Menos de Cinco Días de Ausencia; Próximos Eventos y Noticias Breves. La Academia STEM recibió oficialmente su bandera con el nombre de la escuela como Proyecto Dirige el Camino Escuela de Ciencia Informática. Esto significa que todos los estudiantes en los grados sexto y séptimo completarán la ciencia de la computación para innovadores y creadores a partir de enero. Todos los estudiantes de octavo grado completarán Apps Maker a partir de enero durante sus clases de ciencias. Esto permitirá a los estudiantes participar en experiencias prácticas para abordar problemas del mundo real utilizando la tecnología para innovar ideas. La Academia Holyoke STEM recibió una subvención de $ 15,000 a través de Aprendizaje Innovador de Verizon para implementar los cursos de informática de Proyecto Dirige el Camino. Únase a nosotros para otro Día de FAFSA el lunes 17 de diciembre en la Escuela Holyoke High School Campus Norte (patrocinado por el Colegio Holyoke Community) donde usted y sus padres pueden venir de 9:00 AM a 12:15 PM para completar su ayuda financiera. Esto es importante si necesita ayuda financiera para ir a la universidad. Visite o envíe un correo electrónico a su consejero para registrarse y recibir una lista de los documentos que debe traer. Esto es dinero GRATUITO que no quieres dejar pasar. Hay muchas becas disponibles para estudiantes del último año de escuela secundaria. Visite los enlaces de becas en las páginas web del Campus Norte y el Campus Dean o acceda a ellos directamente en: Estudiantes del Campus Dean y estudiantes de Campus Norte . La siguiente información se incluye con el permiso de Damaris Pérez-Pizarro, reportera que visitó el HHS para preparar el siguiente artículo que se publicó en Español en El Pueblo Latino el 10 de diciembre. La escuela superior Holyoke High brinda un sin número de programas y clases a favor de los estudiantes para que ellos puedan obtener de antemano una idea de lo que ellos desean hacer una vez adquieran su diploma de cuarto año. Desde brindar lo que ellos llaman el “Reverse Job Shadow Overview,” a reuniones mensuales estilo “town hall,” para los jóvenes que participan del nuevo programa Performing and Media Arts Academy, donde los jóvenes adquieren un mejor entendimiento del verdadero significado de las artes escénicas y multimedia, todos se benefician de la esencia de los programas al participar. La maestra de Teatro y Alfabetización Mediática, Bevan Brunelle, brindó un taller bajo el programa de Performing and Media Arts Academy en Holyoke High School donde los jóvenes tuvieron la oportunidad de escuchar a varios líderes de la comunidad y sus papeles en el área de las artes y el multimedia de hoy en día el cual es manifestado de forma imprimida y electrónicamente con un medio variado de medios de comunicación social. Brunelle era maestra de ciencia en la escuela elemental Kelly donde ella le permitía a los estudiantes desarrollar sus intelectos y habilidades manuales creando un invento original. Ahora con su nuevo título de maestra de Teatro y Alfabetización Mediática, ella tiene como objetivo el poder inspirar a los estudiantes a tener una mejor idea de lo que sus estudiantes pueden tomar como carrera en un futuro no lejano. Durante el taller, varios jóvenes participantes se vistieron con máscaras y disfraces y otros participaron escuchando una visita de una reportera local quien les brindó un pequeño relato de lo que ella hace diariamente en su trabajo. Brunelle estará produciendo una obra teatral en la escuela durante los días 11 y 12 de enero el cual los estudiantes podrán realmente experimentar todo lo que se requiere en producir una obra teatral. Vea la sección de eventos a continuación para obtener más información sobre la obra. El éxito en la escuela requiere que los estudiantes participen activamente y están muy comprometidos con el aprendizaje. La asistencia regular a las clases y su llegada a la escuela a tiempo y listo para aprender, permite a los estudiantes beneficiarse de las actividades escolares y en el aula. Estas experiencias académicas compartidas son parte integral del proceso de aprendizaje y no pueden recrearse ni replicarse. ¿Cuántas ausencias son demasiadas? Si un estudiante pierde 2 días al mes, esto suma hasta 20 ausencias por año o más del 10% del año escolar. Los estudiantes que pierden el 10% de los días (18 días si están matriculados para el año escolar completo se consideran ausentes crónicos). Entendemos que hay momentos en que la enfermedad o las emergencias hacen que los estudiantes estén ausentes. Sin embargo, los estudiantes deben esforzarse por no ausentarse más de cinco (5) días en el año escolar para mantener una asistencia satisfactoria. Esto aplica tanto para excusados como para no excusados. Hacer que la asistencia diaria y la puntualidad sean una prioridad es importante para los estudiantes de todas las edades. Los estudiantes que están ausentes crónicamente corren el riesgo de quedarse atrás, no logran el éxito académico y tienen 7.4 veces más probabilidades de abandonar la escuela secundaria. Las investigaciones muestran que una asistencia deficiente en los primeros años puede impedir que los niños pequeños lean de manera competente al finalizar el tercer grado. Ayude a su hijo a desarrollar el hábito de la asistencia regular. Comience con buenos hábitos cuando su hijo sea pequeño: comience a resaltar la importancia y la consistencia de la puntualidad y la asistencia diaria para su estudiante de preescolar. Esto puede llevar a una buena asistencia durante los años de escuela primaria y secundaria y avanzar a la universidad y la carrera. Visite nuestra página web de Asistencia para obtener recursos y más información. Haga clic aquí para acceder a la Póliza de la Asistencia de HPS. Vea un video sobre la importancia de la asistencia constante y la puntualidad en https://youtu.be/hEI13UOWK04. 13 de diciembre – Galletas y Chocolate Caliente en la Escuela Donahue – 5-7 PM Evento festivo para familias en Donahue – Comuníquese con la Sra. Langlois si tiene preguntas sobre este evento. 15 de diciembre – Guarde la fecha para el Festival de Los Niños Hagan el CAMBIO en el Carrusel de Holyoke – de 12:30 pm a 3 pm. Este evento apoya y celebra los esfuerzos de recaudación de fondos de la Escuela Metcalf. Todas las familias son bienvenidas! 16 de diciembre – Reserve la fecha: Recaudación de Fondos Desayuno con Santa, Tavern on the Hill, de 9 am a 11 am, que incluye un desayuno buffet, fotos profesionales con Santa en un hermoso entorno rústico, cuentos y manualidades con los elfos de Santa. Los boletos cuestan $ 10 y se pueden comprar en https://www.eventbrite.com/e/breakfast-with-santa-tickets-5. Todo el dinero recaudado se destinará a la compra de artículos de la lista de deseos para los niños necesitados de Holyoke. 19 de diciembre – Gratis – Concierto de Invierno de la banda y Coro de la Escuela Holyoke High en el Auditorio del Campus Norte de la Escuela Holyoke High, de 6:30 p.m. a 9:00 p.m.
24 de diciembre – 1 de enero – Vacaciones de Invierno – Escuelas están cerradas para estudiantes – (Nota: Las oficinas escolares y del distrito de HPS estarán cerradas el 12/24, 12/25, 12/31 y 1/1). 11 y 12 de enero – La producción Atrapado en el Acto de la Compañía de Teatro de la Escuela Holyoke High a las 7:30 PM en el Auditorio del Campus Norte de HHS – El espectáculo es producido por la Compañía de Teatro de la Escuela Holyoke High, que consta de actores estudiantiles y equipo técnico de noveno a doceavo grado. Atrapado en el Acto está escrito por Pat Cook y es dirigido por Bevan Brunelle. El conjunto para la presentación ha sido diseñado y construido por los estudiantes de Carpintería y David Brueshaber y Chef K y sus estudiantes estarán preparando algunas golosinas para vender en ambas presentaciones en el puesto de concesión. Los boletos avanzados se pueden comprar en línea en www.bit.ly/HHSPLAY o en la Escuela Holyoke High. Los boletos cuestan $ 10 para admisión general y $5 para estudiantes. Los boletos ya están a la venta en el Campus Norte y estarán a la venta en el Campus Dean a partir de este viernes. Si se compran en la puerta, son $15 para Admisión General y $8 para Estudiantes con identificación. Las identificaciones de los Estudiantes serán revisadas en la puerta para todas las compras en línea. Los cantantes de HHS Madrigal han estado muy ocupados en esta temporada de vacaciones. Esta semana trajeron sus espectaculares voces a Gary Rome para compartir villancicos. Ver fotos y videos aquí. También, haga clic aquí para ver el video del evento del Centro de Medios. Gracias a Gary Rome Hyundai por proporcionar entradas para que algunos de nuestros estudiantes asistan al Ballet El Cascanueces del Ballet de Albany Berkshire en el Symphony Hall. Academia STEM Holyoke organizó una Noche Digital STEM el viernes pasado donde las personas podrían explorar las aplicaciones, los juegos de codificación y las actividades que los académicos crearon durante la Semana de la Ciencia Informática. Visite nuestra página de Facebook del distrito para ver las fotos de los eventos proporcionadas por Principal DeMars. Algunos estudiantes de séptimo grado de la Academia STEM de Holyoke fueron a la Escuela Morgan para leer sus libros sobre el ciclo del agua a los alumnos de cuarto grado y enseñarles sobre el ciclo del agua. Baloncesto Unificado – se invita al equipo a ser reconocido en la reunión del comité escolar del 17 de diciembre en el Salón Fifield en el Campus Dean de HHS, a las 6:00 PM. Esperamos que pueda animar a estos atletas en sus dos juegos de exhibición: 12/11 en Chicopee a las 6:15 PM y 12/21 en Campus Norte de HHS a las 6:15 PM. Holyoke High School Seniors – Check out these scholarships!